a gullet size (gullet plate is between blue lines). The saddle is often referred to by its seat size and its gullet size. 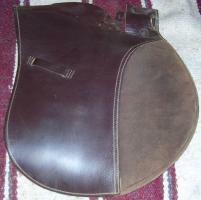 The seat size is measured from the center of the cantle to the button on the side of the pommel. The gullet size is determined by the gullet plate; the saddle typically is narrow, medium, or wide, but saddles are coming in a wider variety recently. A typical English saddle may be called something like "17 Wide," which means that the seat size is 17" and the gullet plate is wide. For more discussion of gullets, see Gullet Clearance. The gullet size is determined by the gullet plate--but it's important that the whole gullet (front to back) leaves space for the horse's spine. Flaps Everything else, aside from the tree, is made of shaped or stuffed leather. 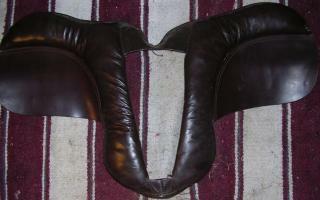 These leather pieces can be pulled off, re-shaped, re-positioned, or have their stuffing removed, added to, or shifted. If you have a quality saddle with a sound tree, then your saddle can easily be customized in many ways. Even the tree and its elements can be somewhat customized. 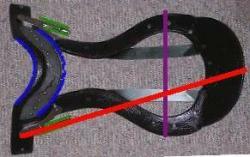 A saddler can replace the gullet plate, although in a conventional saddle this is somewhat more complicated than in a saddle designed with adjustable gullets in mind (such as Wintec or Bates). 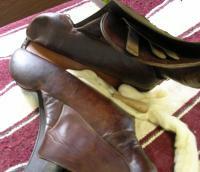 A saddler can also move or replace the stirrup bars. Sometimes the stirrup bars are not set evenly, or are set such that they dig into the horse's back; sometimes you may just want a different type pf stirrup bar. If you have a saddle that has a broken or twisted tree, but is otherwise of good quality, you can even entirely replace the tree. This involves quite a bit more work (and expense). It may not be worth the cost unless the saddle is a very high quality one. I'm afraid that there are parts of the tree that can't be changed, though: the seat size and width are pretty much fixed, unless you want to entirely replace the tree AND the leather around it--at that point, it's probably easiest just to get a new saddle. See Saddle Fitting for more information. Once a fitter has determined how well your saddle fits, many adjustments can be made. Some adjustments can be made without even disassembling the saddle. If your saddle fits generally well, but needs the flocking shifted or a slight addition, these adjustments can generally be made on the spot. If your saddle could fit but needs more major adjustments, the saddle fitter may have to take the saddle apart (or send it away for servicing). Major adjustments could include a large change in the flocking, moving the panels themselves, or evening the panels if they are not set on straight. 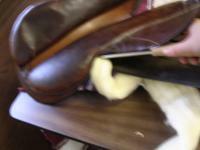 To reflock a saddle, the fitter must remove the panels from the tree. This is a more lengthy process and requires a few more tools. 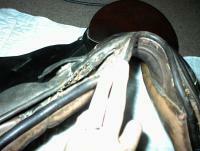 The fitter will remove all the old flocking from the saddle, and replace it with new. The fitter must be exceptionally careful to fill the panels evenly with respect to each other, and to fill them smoothly with no lumps. The fitter will take the shape of your horse's back into account when the panels are reflocked. The fitter should also return after a set time (it depends on how often you ride; typically 20 hours of riding) to check how the panels have settled and make adjustments if necessary. 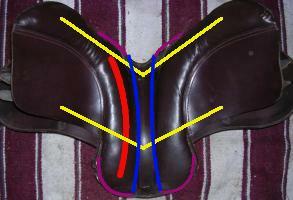 A saddle will need a full reflocking if the panels are very hard or have lost their "bounce." 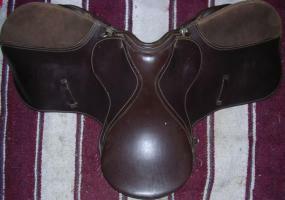 A saddle may also need reflocking if it has been used unevenly; if the rider or the horse compresses one panel more than the other, then the panels will not be symmetrical. A rider who leans to one side, or a horse whose back is not symmetrical, can cause the panels to wear unevenly--both of these are quite common. 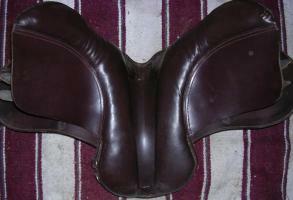 There's so much that can be done to customize an English saddle. Having your saddle customized can even be less expensive than some of the specialty pads that are made to adjust your saddle's fit. And when your saddle has been fitted by a professional, you know it fits--rather than just guessing that the pad you've added makes things sort of right.